Irritated from rubbing against clothing. 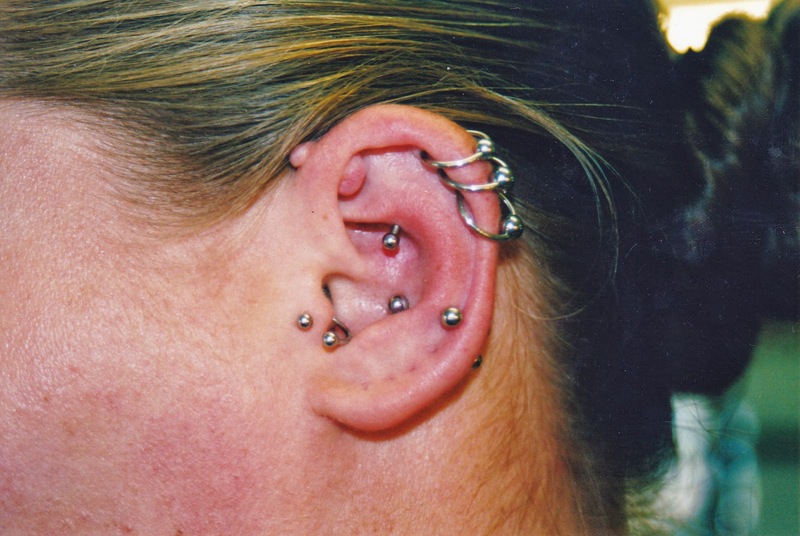 * My 21 years as a piercing professional is not a substitution for a piercing friendly, medical doctors treatment! Please consult a doctor immediately when you have any doubt about your health and well being. I know I know - you are a smart cookie! You did your homework before getting something pierced. You ask folks with beautiful body mods for piercer recommendations. Visited piercing shops. Did a bit of online research. Yet months after the healing period for your particular piercing is suppose to be concluded-you are still having issues. Perhaps you have had the piercing for years, yet all of a sudden the hole is becoming fussy. Bothering you for no good reason. "Healing Times" are approximate. All piercing clients heal at different rates. If you are very fit and healthy your healing time may be much shorter than quoted. However, if you are smoking, drinking and living in life's fast lane-well that just slows down your over all immune systems performance. Recommit yourself to your piercing care program. Perhaps some Vitamin C added to your diet? Give it a go for at least a 2 additional weeks. Most of the time you will see an improvement in days. Did you change the starter jewelry to something more "fun"? A good deal of the time clients will want to put in different jewelry the very day the new piercing is suppose to be "healed". Sometimes the method of jewelry removal or insertion can create irritation or discomfort where there was none before. Jewelry with a nickle content can bother piercing of any age. If I even wear a belt buckle with nickle in it I break out in a rash! Reinsert the jewelry your were pierced with. If it was the newly inserted jewelry causing problems you will see an improvement within a day or two. Did you prepare your piercing jewelry properly for removal and/or insertion? This is a crucial step for comfort with any piercing. Washing the piercing with mild soap and warm water is best. However, even cleaning the area with a moistened towelette will work. Clean the entire pierced surface with gentle motions. While there is still a dampness to the skin and jewelry, slowly remove the current jewelry. Take the new jewelry, clean according to directions. Then apply a tiny bit of essential oil to the end of the jewelry you will be inserting into your piercing. Use your other hand to hold the area taunt -this will help guide the jewelry through that pretty tunnel. Wallah! Easy and pain free. Make sure to tighten any threaded end with clean and dry hands. Next time you bathe, rinse well. Your bellybutton piercing will never "move" like your ear lobe piercings. Is your jewelry the proper gauge, length or circumference for YOUR piercing? Irritation can be caused by ill fitting jewelry. Just because your friend can wear a 1/4 inch hoop in her nostril does not mean it will work for you! It doesn't mean something is wrong with your build, or that your piercers placement was not correct. Very best thing to do when buying new jewelry for the first time is patronize a good piercing shop-and be properly fitted with quality jewelry. Once you know what gauges + length or circumference fits best for you, then you can be sure never to waste money buying ill fitting jewelry again. Keep your hands away from the piercing! I cannot stress this enough. Many times clients have come into Lucky 7 complaining of having problems with their new adornment. While discussing the possible causes I will see these clients touch the piercing over and over again. In my opinion, touching a piercing over and over again, especially without cleansing your hands first, will result in irritation at least, infection most likely. I once read that humans touch their own face at least a few times every minute of the day. Isn't that crazy!? So be sure you keep your hands away from the piercing site, except when caring for it according to your piercer's instructions. What is your piercing coming in contact with during the course of your day? Clean pillowcases and wireless phones are very important for facial and ear piercings. Clean sunglasses/eyeglasses and headbands are also important. Pillows in a hotel, or at your loved ones home may have fresh cases. BUT it is what may be living inside the pillows filling that can cause problems. If in doubt, bring your own pillow for overnight stays during healing. If that cannot be done lay your own t-shirts over the pillow. This keeps your bodies own"flora and fauna" close-and others away! Same rules apply to bed sheets, comforters, sleeping bags, etc. Take a mental inventory of all the fabric surfaces you piercings may be coming in contact with. Make sure they are clean, or that your piercing is guarded from contact if in doubt. Irritation or Infection? Very often piercing customers will contact us saying: "I think my piercing is infected." Most times, after we examine the pierced area, we find the proper description would be irritated. The site may be pinkish, a bit of flaky skin surrounding the jewelry. A wee bit tender. Slight swelling.. A little dry crusty matter at the start or end of your day. All of these concerns our common in the first stages of healing - and are quite normal. Perhaps a change in your care procedure or product may help? Most often the piercing just needs normal care and TIME to heal........However, if there is: PAIN - YELLOW, GREENISH OR GRAYISH DISCHARGE OR PUS -REDNESS THAT IS SPREADING-HEAT AT THE SITE-SWOLLEN LYMPH NODES - FEVER- do NOT take the jewelry out (as the hole with jewelry still inserted may help the area drain) and see a doctor at once! Do not wait. If you procrastinate it could cause unspeakable damage to your over all health. When in doubt get some help from a qualified professional. Your friend who has "a lot of piercings" does not qualify. Sometimes our friends make us more scared than need be by telling us horror stories of piercings gone bad. In no way is that providing a solution to your situation my darlings! Remember that no one knows your body better than you do! Listen to your gut. Be proactive in YOUR PIERCINGS healing.